While recent experience told King that Doubleday didn’t want to publish more than one book by him a year, they most definitely wanted no less than a book a year from him, either. After he finished The Shining, he spent a couple of weeks writing “Apt Pupil” and then returned his attention to the abandoned Hearst-inspired novel, The House on Value Street. He spent another six weeks on it, but the story still wasn’t taking off. Then he started work on one of his longest novels, The Stand, and realized early on that it wouldn’t be finished on Doubleday’s schedule. So, to bridge the gap between novels, King offered them a short story collection. Night Shift assembles twenty stories. The earliest, “Strawberry Spring,” was first published in 1968 and the most recent, “The Man Who Loved Flowers,” came out in late 1977, shortly before the collection was published in early 1978. Four stories—“Jerusalem’s Lot,” “The Last Rung on the Ladder,” “Quitter’s Inc.” and “The Woman in the Room”—were previously unpublished. Nine were reprinted from Cavalier, and two each appeared in Ubris and Penthouse. The remaining three stories first appeared in issues of Maine magazine, Cosmopolitan and Gallery. Bill Thompson took an active hand in helping King pick the best of the available stories for this collection. Among others under consideration were “The Blue Air Compressor,” “It Grows on You,” “The Man Who Would Not Shake Hands,” “Survivor Type,” and “The Wedding Reception” (later published as “The Wedding Gig”) as well as some unnamed poems. In an editorial letter to King, Thompson referred to these rejected stories as being “too much ‘Steve-the-student writer’” stories—adding that “Survivor Type” was too grisly. He felt they could do him more harm than good. “This is as important a book for you as a novel,” he said, believing Night Shift would generate more reviews than previous books and no “writing gaucheries” would be overlooked. King obviously listened, though he did allow a few of the stories to be collected subsequently. The book is introduced by John D. MacDonald, most famous for his Travis McGee crime novels. His latest book, Condominium, and The Shining were together on the bestseller list as he was writing the introduction, he says. He goes on to praise King’s work ethic and his writing, citing specific examples. King also contributed a lengthy foreword in which he discusses the nature of fear and our fascination with it—about why people read horror fiction and why he writes it. In interviews, he says that he stands by the stories in this collection, as well as most of his early publications. Though money was one motivation for their publication, he says that he wrote them because he was inspired to do so and never with tongue-in-cheek. These were straight horror stories. King says that, if he isn’t pressed for time, he usually writes, “I hope you’ve enjoyed these one-reel horror movies,” when signing copies of Night Shift. Many of the stories have been adapted as feature films, either by themselves or as parts of anthology films like Cat’s Eye. “Children of the Corn” has been filmed twice and spawned seven sequels. King wrote a screenplay for NBC called Daylight Dead based on three of the stories (“Strawberry Spring,” “I Know What You Need,” and “Battleground”), but the script fell afoul of Standards and Practices, who considered it too gruesome and intense. Producer Milton Subotsky acquired the rights to half a dozen of the stories, intending to create an anthology TV series or themed features, but funding and other issues kept those projects from getting off the ground. Despite Thompson’s comments about anticipated reviews, Doubleday wasn’t optimistic about the collection’s prospects. The first printing was smaller than for ‘Salem’s Lot. 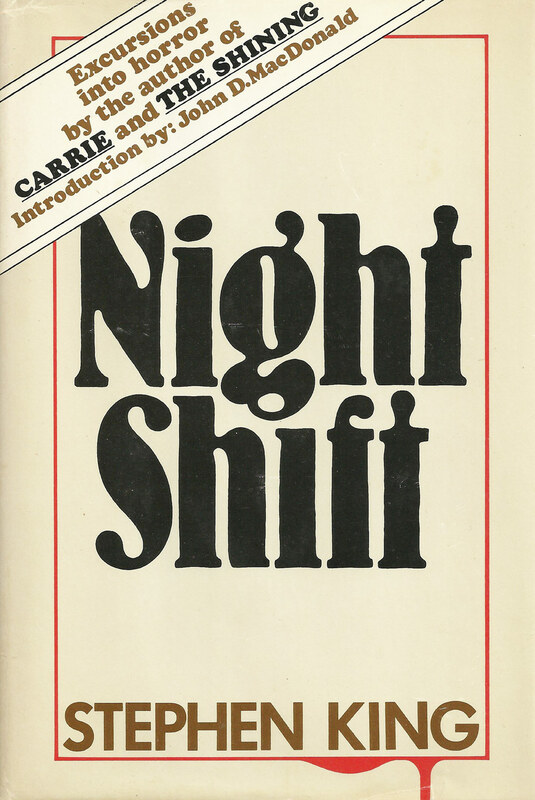 However, Night Shift proved to be immensely popular and Doubleday had to go back to the press for a second printing within weeks of publication and, according to one source, they had to raid the cache of copies designated for book clubs to satisfy bookstore and distributor demand. It sold around 24,000 copies in the first year, very respectable for a collection. The complete list of the books to be read can be found on the Stephen King Books In Chronological Order For Stephen King Revisited Reading Lists page. To be notified of new posts and updates via email, please sign-up using the box on the right side or the bottom of this site. Interesting thing about Thompson and rats. What an awesome collection of short stories. Who would have guessed That Children of the Corn would end up birthing the most adaptations out of every story in that book! I know, spell checker probably did this, but ” “Survivor Type” was too grizzly.” means it was a big bear. That should be “grisly”. Thanks for letting us know how Night Shift came about. I remember buying it when it first came out in paperback. I had never heard of John D. MacDonald at the time, but now have all his books in my collection, and like my SK books, I tend to reread the every few years. Bev, Is Bill Thompson still alive? To the best of my knowledge, he is. Yes, thank you for the “Night Shift” info. I bought Night Shift when it was first released, and loved it. I had no idea about all the hubbub (sp?) until reading this article. Thanks for the background. I love SKRevisited! So much info about my favorite author and his vast collection of books. Love it! Always enjoyable to read the story behind the stories. Thank you for presenting it so well. I am enjoying all of the historical essays! Very, Very Interesting! I suspect your plans are to put these in a book after you finish all 70 reviews! That would indeed be our hope!